I was in Uldum tonight questing for some transmog gear when I came to everyone’s favorite mass-murder excused by a machine, Gnomebliteration. As the gear I wanted for my warrior was a reward from said quest of doom, I set aside my in-character brain for a bit and rolled a flaming ball of death over the doomed expedition. I killed a thousand gnomes for some red plate gloves. And I liked it. My opinion of the quest hasn’t changed since the last time I wrote about it. I still think its morally repugnant, out of character for a lot of characters, and a hell of a lot of fun. But at the end of Cataclysm I’m left wondering, why wasn’t this made into a daily quest? This is a serious question. You’ve got a quest which is popular and provides a fun little mini-game. It’s in a zone which only has two daily quests for reputation, both of which have different mechanics than normal play and the body count of an ’80s action movie, so killing cursed gnomes fits in with the theme of Uldum. The quest got a lot of positive feedback on the forums and on wowhead. Players asked to do a quest again – that’s pretty high praise! So why didn’t it happen? Normally, when I write a post like this I have some kind of action that I’d like to argue for, some option or alternative to pursue. Here, I don’t. There are less than two months before Mists; thinking this should get changed now would be naive folly. It’s done. Gnomebliteration is never going to be a daily quest. That’s okay! It’s time to move on. And I don’t think we, as players, will ever know why it didn’t happen. Development priorities are subject to a lot of different pressures, and I don’t subscribe to any A/B team conspiracy theories. Did this idea even get raised to the developers? Did it get serious attention? We’re there other priorities that kept it pushed down on a feature request list, or was it shot down for technical reasons? Was it deemed more important to keep it a unique part of leveling, one shot and you’re done on that toon? Or did someone just not like the suggestion? What I do know is that, while rolling around a giant flaming ball of death on a quest I should have morally objected to for any good-aligned character, I had more fun than I’d had in the entire zone. Possibly the only real fun I’ve had in Uldum, once I get over how gorgeous the place is. Wheeeee! roll down the steps, pick up more gnomes! It’s not a complicated mini-game, it’s a visceral one. And to me, this quest seems to symbolize the problems of Cataclysm. Many things were done right, but the things which were truly fun seemed to be shunted aside, fleeting moments. Opportunities to create more fun weren’t capitalized upon. Instead of Gnomebliteration as a daily, we got Tol Barad and the Molten Front. There were a lot of almost-rights, of things which were just a bit off, of things which didn’t quite flow enough to be fun. Would we have gotten bored of crushing cursed gnomes? Maybe. But we never got the chance. I’ve come to accept that I don’t think Cataclysm was a very good expansion. Yes, there were plenty of quality of life improvements which made the game more enjoyable to play – vast UI improvements, transmogging, revamped old content, flight almost everywhere – but many missed opportunities for making the game fun. It was so close to being good, in so many places, but the execution was off. There was a lot of good work, and the game of Warcraft itself is still enjoyable, but I just haven’t found Cataclysm content compelling. I haven’t found it fun. I don’t really have much else to say about Cataclysm; I had fun, I had frustrations, I’m glad it’s done. And I’m left wondering why Gnomebliteration never became a daily quest. When Cataclysm first came out, I was helping my former guild’s transition from a 25s to 10s. I admit, a lot of the new content I didn’t really pay attention to. There was too much for me to process, I suppose. However, as I went back and started to level characters and revisit areas, so many times I’d finish an area annoyed with abruptly ended story-lines, too linear questing and just a feeling of wanting something more. If I wasn’t in the guild I was, with the people I interact with, this content probably wouldn’t have kept me interested very long. Bring on Mists! Of course, all that aside, there’s really no good reason I can think of for not making it a daily. It’s FUN, and the zone REALLY needed another one for Ramkahen rep, the worst out of all the questing factions (since only 2 dailies, and half a zone worth of rep quests). Throw us a bone here Blizz – we can only hammer pygmies and cannonball Nazis for so long. From time to time I would do the pygmy hammer quest, despite having maxed out my rep with them long ago. Simply because it was easy and fun. WTB more dailies like hammer quest and gnomeballs–ones that are fun and don’t make it feel like a tiresome job. To be fair, the Ramkahen are the ones who send you out to investigate that area in the first place, so this being a daily for them makes a LOT more sense than “Fires in the Sky”, where the Indiana Jones rip-off plot has nothing to do with them. Glad someone else wanted Gmomebliteration as a daily. Although Uldum I have to say was my favourite zone, with Vashjir easily the least favourite. But I hope Blizz never again do dailies inside an instanced area like flamelands. Vashjir, yuck. I couldn’t even finish the quest line there. Still a good 2 dozen quests to go. Glad I didn’t need to get their head enchant for my lock. Hyjal was hard enough. Cataclysm was not a very fun expansion, I think, but it seems to me that it was a necessary one. My theory is that it was weak because there was a huge- a massive- an unimaginably consuming push for the development team to use Cataclysm as an opportunity to fundamentally fix the architecture of the game itself, under the guise of an expansion. The new zones and quests and all the actual ‘expansiony’ features were just a thin veneer laid on top of a profound changes that would never be seen by the player. Though of course WoW was put together pretty well the first time around (if we use financial success as an indicator of coding prowess), times change, technology marches on, and a the game’s basic infrastructure needed an overhaul. I haven’t read any stories about this, and Blizzard certainly didn’t hide the fact that they were using the world changes described by Cara’s apocalyptic theme to fix old problems, but I think it went much, much deeper than that. Cata is short, and weird, and unbelievably dull for the most part (oh, those Molten Front dailies. I, for one, welcome our flaming overlords.) It’s so out of character for Blizzard- and they’re such a smart company, that knows fun arguably better than any company on the planet, that I don’t believe for a moment it’s because they’re lazy or bad. I think all hands were on deck to profoundly change something about the software itself, for which the expansion was a servant. I’ve been reading a lot lately about the problems faced by the developers re-coding Baldur’s Gate, and it reminds me so much of Warcraft: here’s this epic, amazing, wonderful game, but you pop the lid and you’ve got a family of squirrels living in the engine. I agree with you Cyn, they should have made Gnome-bowling a daily quest. I made sure that every alt I leveled through Uldum at least completed that one quest before I moved on to Twilight Highlands. wonder if I have a toon that hasn’t done it? I could do it, then drop quest, for a daily-like effect. 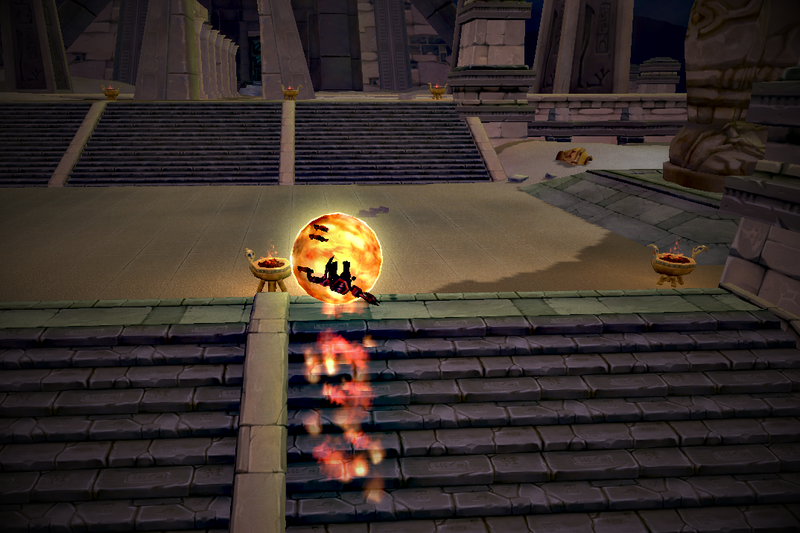 There’s always a good time to obliterate zombie gnomes (!). Even my fellow Ally guildies agree with that. That said, the pure fun of a flaming ball of death could easily have been put into a daily, but for whose faction rep is a problem. I guess you could put it into the rep for the Archaeology group for each side, since it’s technically an ancient curse, but definitely it doesn’t fit into the Ramkahen’s area. A flaming ball of gnomic death? Sign me up! Blizz just doesn’t do morality, or at least ethics. I’m also fairly sure that they don’t understand the difference. It’s unfortunate, the base set-up is good for exploring gray areas but they aren’t up to the task. The infamous torture quest would have been better if you had been provided misleading, or flat false, information just to get the pain to stop. Or perhaps the Dalaran’s bring charges against you and the Mage who gave you the device. But no, hypocrisy is fine so long as it works. When I finished Bowling for Gnomes I fully expected to have a follow-on to go down into the ruins – where I should have discovered that there is a cure. That would have added emotional context and provided, for Alliance players, closure with the Gnomes. Yes, I slaughtered thousands of your people but look what they were guarding, now you can be safe in the future. It could easily extend to the Horde by making it a mixed pack of cursed Gnomes and Goblins. Writ large, I think that Cataclysm was not a failure but a collection of failures. There was no unified context with each zone presenting a unique problem set that was, in theory, part of the larger problem. It never played that way. Moving from Hyjal to Deepholm felt like two different expansions. There was no connecting context other than “Deathwing is a bad dragon” and that wasn’t enough for continuity. Three of the four zones with dailies were phased or instanced, breaking the connection to the rest of the game world. Outlands, the shattered remnant of a world, felt more organically whole than the zones in Cataclysm. You are right on in so many ways. Just sayin…. I’ve been saying this since the first time I leveled through Uldum. Gnomebliteration was an absolute blast and needed to be a daily. The server-side performance hit of that quest was massive. The programmers asked that we *not* make it a daily quest. Thus it wasn’t. Ha! Okay, well, that is a simple answer. It feels like the Wintergrasp effect, then – you have something that’s too popular for the architecture and hardware to handle, so limits (like this one) are put in place for it. It’s disappointing, but understandable, but still disappointing. I suppose that’s why the Fire From the Sky daily is pseudo-instanced? All the troops marching around? Interesting. Operationally you would hope for distributed popularity – it’s cheaper and easier to build a system that handles 30,000,000 transactions over the course of a month than one that handles 10 million in 3 hours – but user behavior probably isn’t ever really like that. A quest, a city, a zone becomes popular, players flood it like the phone lines on American Idol voting night. Northrend crashes the world server, Dalaran becomes Lagaran, and a giant ball of fiery death daily takes out Kalimdor on a regular basis. The problem of game launches and spiking traffic versus making content people REALLY get excited to do. Thanks for the response, Xelnath. This is the kind of insight that makes one think. In truth, the servers *could* handle a reasonable number of players doing that quest. What it could *not* handle is a flood of players doing that quest. Same issue with Plants vs. Zombies. Yeah, from a technical standpoint it makes sense. As the players move through different phases of content, certain areas will be visited in predictable waves – floods of players through the initial leveling zones will taper off and move back into instanced content, but then move back through different new areas as patches are released. Certain code segments (daily quests in cities, for instance) provide a constant, predictable level of utilization, while current content can be adapted with the understanding that even if it’s too resource hungry, it will eventually be obsoleted. There’s an interesting game design question here – when do you split off these little mini games into their own instances, segment them so they don’t impact other parts of the game’s architecture? That’s a balancing act I don’t envy you having to walk. It’s a lot of work to move something like PvG into an instance. Load balancing, where there’s a single point, not of failure, but of data. In this case, you do something, and expect the wow database to remember that you have done it. How? replicated servers?